I’ve been an affiliate of Lazada for years now, since inception of this blog and my other blog, SavingsPinay. Lazada has always been my go to online shop at times when I just needed a quick browse on what’s new. You can almost buy everything in this A-MAZ-ING marketplace. I am always on the look-out when they have flash sales especially for lipsticks, skincare items, tech gadgets and the like. This site is perfect to find and buy gifts for your loved ones. Did I mention that I bought my Diva Ring Light in Lazada for less than Php 5,000! 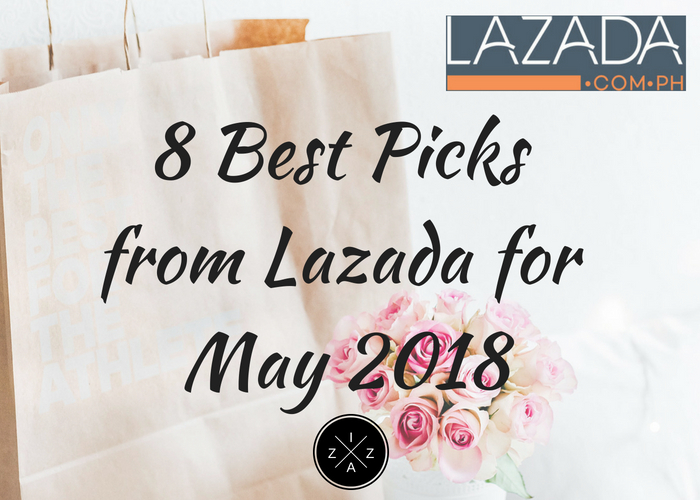 I decided to do a new series wherein I feature my best picks from Lazada on a monthly basis. DISCLAIMER: This post contains affiliate links, which means I receive a tiny portion if you make a purchase using this link at no added cost to you. Thank you for supporting IzzaGlinoFull. The Creamy Cheek Paint Peach is part of BLK Cosmetics newes installment, the K-Beauty Collection. The limited edition K-Beauty Collection is a kit with Anne-approved Korean cosmetics line featuring everything you need to nail that distinct K-style look– from the fresh, dewy skin and all-natural flush, to the dreamy eyes and juicy (or edgy) lips! The Creamy Cheek Paint is a full-proof K-style liquid blush for Php 349. Its light, silky texture mets on the skin seamlessly which guarantees a second-skin finish. The BLK Cosmetics Creamy Cheek Paint comes in two shades, Peach and Strawberry. The product comes with a doe foot applicator that has a wider tip than the usual. I find this inclusion smart because you can either put a dot on each cheek and blend away or put some at the back of your hard, warm up with the finger to blend. It is also Anna Cay-approved, one of my favorite beauty vloggers ever especially the Peach shade. What to love about the BLK Cosmetis Creamy Cheek Paint? Another part of the BLK Cosmetics K-Beauty Collection is the Intense Color Liquid Eyeshadow. Liquid eyeshadow may sound too old school for some, but for Koreans it is the perfect formula for a natural look. Put a bit of the lightweight formula product on your lids using the wand and pat, pat, pat. Gently blend out using your finger or a blending brush until it dries down to a smooth and budge-proof finish. I am honestly excited to get this because I always wanted to try effortless eyeshadow on a daily basis especially going to work. I’ll probably take a matte bronzy eyeshadow on a crease to make everything put together. The BLK Cosmetics Intense Color Liquid Eyeshadow comes in four different shades I Love You, Gorgeous, Hello and Cute. What to love about the BLK Cosmetics Intense Color Liquid Eyeshadow? L’oreal finally come with a brow pencil that mimics that of the ever so famous Anastasia Beverly Hills Brow Wiz, the Brow Artist Xpert 2-in-1 Brow Pencil. The L’oreal Brow Artist Xpert is the first 2-in-1 mistake-proof brow pencil and brush for perfectly defined and fuller looking brows. The brush on the other hand helps for on-the-go girl. Aldo did I mention it comes with seven different shades so you will be sure to find the right one for you. I am someone who can’t step out of the house without doing my brows so I find this to be a total life saver. Something I will definitely bring on my next trip. What to love about the L’oreal Brow Artist Xpert 2-in-1 Brow Pencil? Maybelline Super Stay Matte Ink Liquid Lipstick is a non-drying matte liquid lipstick that promises to stay up tp 16-hour long on one swipe. The product has intense waterproof pigments on one swipe. Maybelline created a selection of 10 shades that fit every Filipina’s skin tone. How to best use the liquid lipstick? (1) Start with a well-prepared lips. I highly suggest trying Human Heart Nature Lip Scrub in Peppermint. Buy it here. (2) Apply the liquid lipstick from the center of the upper lip following the contour of your mouth. (3) Next go through the entire bottom lip. You can re-apply to further intensify the color or stay at one swipe. What to love about the Maybelline Super Stay Matte Ink Liquid Lipstick? It lasts up to 16 hours and is waterproof, smudge proof and transfer proof. Belo certainly does not joke when it comes to skincare especially with their release of the Belo SunExpert Transparent Mist with SPF 50. The transparent mist is a revolutionary sunscreen product that oppose the usual sunscreen lotion out in the market. To use the product you can spray on dry skin and spread all over. For the face spritz some first on your hands and just pat on your face. Because it is a liquid type, it is easily absorbed by the skin. You don’t need to wait for minutes before doing any water activities. Plus the mist is transparent and won’t make you feel greasy at all. I used this during my Eastern Samar trip and even above makeup, the product works! Just when I thought I got all dark and tanned at our Minasangay trip on day two, the photos taken the following day proves otherwise. Nice! What to love about Belo SunExpert Transparent Mist SPF 50? Vitapack Megawhite is the newest glutathione to hit the market. Each capsule contains 250mg of Glutathione which is a powerful antioxidant used as an inhibitor of melanin. Effect on the skin - Proven safe effective whitening ingredient when taken on a regular basis. 50mg of L-cysteine, an amino acid which is a precursor of antioxidant glutathione. Effect on the skin - Having optimum levels of cysteine can stimulate the body to produce its own glutathione. 100mg of Calcium Ascorbate, the “non-acidic and non-sodium” form of Vitamin C. Effect on the skin - Known to promote oral absorption of glutathione by the body without the side effects of regular Vitamin C.
Reviews of the Vitapack Megawhite Glutathione Skin Whitening Antioxidant are all positive with results even at after 10 sachets. There is also Vitapack Megawhite Glutathione Skin Whitening Antioxidant Supplement Set of 2 Boxes (40 caps). What to love about the Vitapack Megawhite Glutathione Skin Whitening Antioxidant Supplement? Have you ever wondered how sleeping masks work? Fortunately there is a budget-friendly sleeping mask available now in the market. Presenting the Garnier Light Complete Yoghurt Sleeping Mask. The Garnier Light Complete Yoghurt Sleeping Mask is boosted with White Speed Serum & Pure Lemon Essence + Soy Yoghurt Probiotic Extract + Vitamin C. The product aims to nourish and renew the skin, reducing dullness when used on a basis. The fast whitening action even takes effect at first night. How to best use the Garnier Light Complete Yoghurt Sleeping Mask? You can implement the sleeping mask from Garnier on your night regimen and end your day to get smoother, lighter, and softer skin and to exfoliate dead skin cells. What to love about the Garnier Light Complete Yoghurt Sleeping Mask? Happy Skin is an original brand of skin-caring makeup created by Jacqe Yuengtian-Gutierrez and Rissa Mananquil-Trillo. They have multiple products already since launching and they have come out with an affordable gel nail polish in the most perfect color selection ever. Gel polishes became the new in for these manicures are gentle to the natural nail and the polish stays intact on the nail for at least a couple of weeks with high shine and no cracking, peeling or chipping. Some of the best gel nail polishes are priced in between Php 500 to Php 800 each but Happy Skin released something that’s less than Php 300. Winner! My favorite got to be Happy Skin Express Gel Polish in Influencer which is a nice gray color. Something that works for any outfit. Hope you enjoy this first installment. Will definitely try to do it on a monthly basis and even give an update for the products I have tried from the list.